Heeft u een vraag voor Haeundae Guesthouse? Tijdens uw bezoek aan Busan zult u zich snel thuisvoelen in Haeundae Guesthouse, dankzij de hoge kwaliteit en de goede service. Gelegen op 14 km van het hart van de stad, bevindt dit 1.5-sterren hotel zich op een excellente locatie met de grootste attracties binnen handbereik. Dankzij de praktische locatie liggen alle belangrijke trekpleisters in de buurt van het hotel. Bij het Haeundae Guesthouse staan de excellente dienstverlening en superieure faciliteiten garant voor een onvergetelijk verblijf. Het hotel heeft een uitgebreid aanbod aan services, inclusief gratis wi-fi in alle kamers, wi-fi in openbare ruimtes, parkeerplaats, wasserij, conciërge. Alle accommodaties beschikken over doordachte voorzieningen om een ongeëvenaard gevoel van comfort te garanderen. Daarnaast garanderen de talrijke recreatieve mogelijkheden dat u zich tijdens uw verblijf kunt vermaken in het hotel. 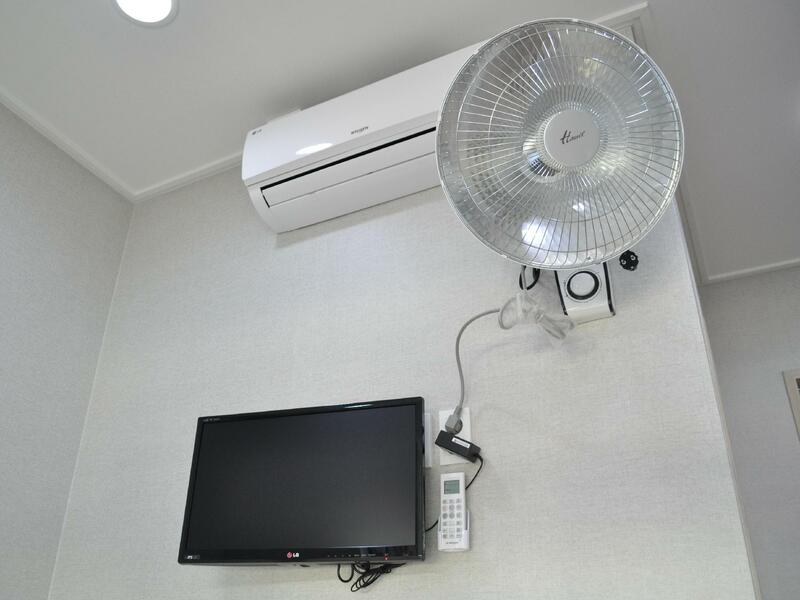 Het Haeundae Guesthouse is een ideale verblijfsplaats voor reizigers die charme, comfort en gemak zoeken in Busan. Staff was very kind. The guesthouse was spotless in all areas. Very clean. The room I was assigned was quite small. There wasn’t much room for 2 people and their bags to fit in, but for a short stay it was ok. Some of the rooms are bigger than the one I had. Also, at the moment there are no laundry facilities available (which was partially why I booked this hostel, but the staff kindly found one nearby at Haeundae beach). Location is really convenient. The beach is a very short walk, as is the metro. Haeundae Guesthouse was clean and comfortable. Very close to Haeundae Station and Haeundae Beach. You are right in the middle of all the action. The most important thing to note is that it is located on top of a bar and karaoke room so at night the noise travels up. If you are a light sleeper you will probably not get much rest on the weekends. Very CLEAN room and bathroom. Staff were all very nice and kind. They waited for us to check in at night because we were late arriving in Busan. Location was very close to the beach. Breakfast was good. The only disappointment was the noice of the people at the bar all night. Barely able to sleep. Would be nice if the rooms is soundproof. Over though, great value of your money! Best Place just 1 minute from haeundae MRT Station. You can reach various nice place such as haundae beach by walk 1 minutes, Song-Nim Park and Dong Baek Park (mermaid statue) by walk 10 minutes. Sorrounding by restourants, halal restourants, mini market. So you can not be starving. At least therea 3 halal restourants by walk jus 1-3 minutes. 2 of them just infront of the guesthouse. The facilities also good. Even laundry machine with capacity 10 kg is available. They also have good breakfast. Spacious room for doble bed room. The only problem just noisy. It can be proble if you sensitive with noisy. overall is affordable. I will glad to stay in this guesthoese again. very close to the station ,just only 5 mins walking to the guesthouse and around 10 mins walking to the breach.There are so many fabulous restaurants downstair so you won't have to worry about hunger . Receptionist are kind and helpful. 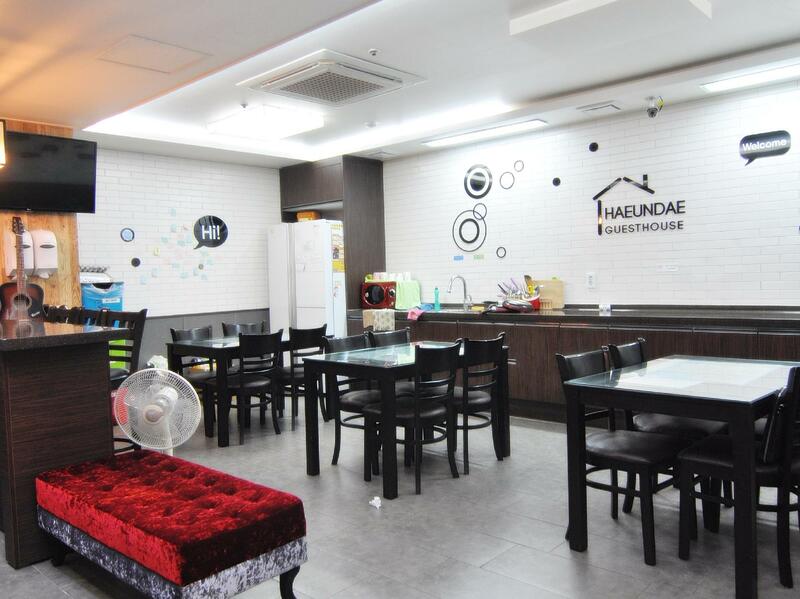 Convenience stores, restaurants, coffee shop, pubs, bars and malls near Haeundae Guest House. Haeundae Beach and Train station Exit 5 is also near. Haeundae Market about 10mins walk. Area good for nightlife. They provide ear plugs for your convenience. Breakfast time is 8-10am. Be sure to have it early because dining area gets crowded around 9am. Good 20mins walk to Dongbaek Island, Naru Apec park, Westin Chosun Hotel and Bay 101. Jogging path provided at Dongbaek. We tried the eel and "cricket??" For exotic dining at Haeundae Market. I advise you to take the LRT Line to Daejeo switch to Brown Line to Suyeong and transfer to Green Line alight at Haeundae Exit 5 <- elevator provided near here. I had a pleasant stay in this guesthouse. Reasonably priced. Great location. Clean. Near subway, restaurants, convenience stores and the beach. The only thing is it's noisy at night due to the nearby pubs that are open until wee hour of the night... but it was not a problem to me... overall, I'll stay again in this guesthouse. The hostel is new and clean. 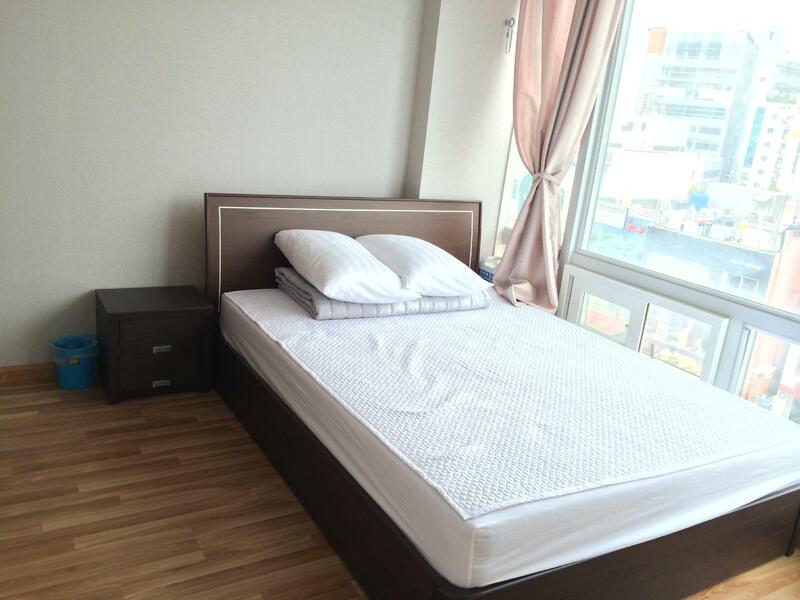 Great location in Haeundae in between the subway and the beach. Right about Thursday party with plenty of restaurants in the area. The staff was fantastic. They speak English, eventhough Korean is their first language and I also heard them speak Chinese as well! Super friendly. The eggs, toast and OJ breakfast was fine for me (you cook it yourself). My only minor minor complaint is the the dorm room is so small, but the bed was comfortable and it was clean. Love the room number 106, very good view. Can see whole street view. 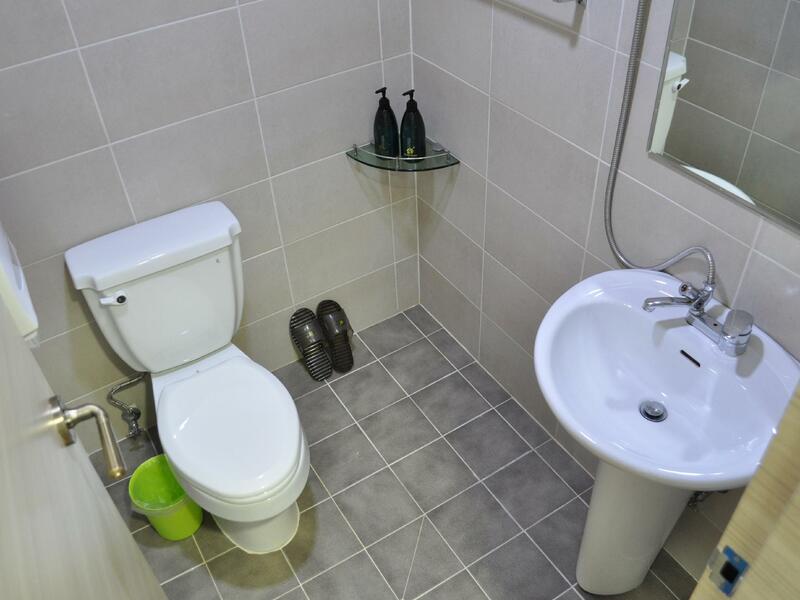 24 guest house is 3 min walking distance from haeundae station exit 5. It at 4th floor, 5th floor have Thai massage services. Also walking distance to aquarium, local market. Many many skin care shop around there. Easy to search food around there like Indian , chinesse , and Very famous Korean BBQ chicken also around hotel. Near Haeundae station, breakfast included, room is clean, and there is elevator! Although it will be a little noisy at night due downstairs bars. Overall, it is a good hostel. Recommended if stay mostly in Haeundae. Location is good, only take you 5 mins to go to the beach, and room is pretty clean, even toilet and bathroom isn't separated, it's still acceptable. And Most important is there is an elevator in the building, when door opens the staff station is right in front of you! Super convenient! This hotel was closed. Dont book here. Wasted my money. Plenty of other accomodation choices which offer better comfort. Noisy as pub just on ground floor. This guesthouse is close to the beach and offers free breakfast. It is quite a value and all the staff are kind and helpful. Place is near Exit 5 of Haeundae Beach Station and near the beach and Dongbaek Island. Only five-minute to the beach and is in the center of the town. Staff who speak fluent English are nice and helpful and always offer help. If your a beach bud this hotel is for you. Accessible to the beach, subway station and surrounded with foodstalls. The value of money is worth every cent. The room is clean but not too spacious to move around.